Cleverly Solved | My Lock-top or Lymance style damper still lets in a cold draft. 03 Apr My Lock-top or Lymance style damper still lets in a cold draft. If you install a Chimney Balloon low in your fireplace you will eliminate this cold draft sensation. You may have concerns about the lock top or lymance damper chain or cable interfering with the Chimney Balloon, but we have found most of the time the Chimney Balloon will form around this chain or cable without a problem. However, there are a few things to keep in mind about the chain or cable for a lock top damper. In the picture above the top sealing damper cable as a very faint line just to the left of the Chimney Balloon valve in the picture (see the orange arrow). You can also see that the Chimney Balloon has folded around and enveloped the cable. You see the cable runs along the edge of the metal damper there as well. 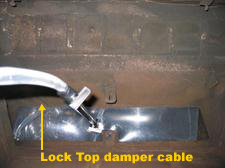 In this application, the cable is getting frayed over time as it rubs up and down against the metal edge of this damper opening. That frayed section of cable has little needle-like protrusions and a flat side that is like a saw blade in roughness. Also, notice that the Chimney Balloon is tight like a drum. It is probably a little two tightly inflated. In this type of application wrap packaging tape around your chimney top damper cable in the area, the Chimney Balloon will come in contact with it. This will keep the flat sharp end of this cable from cutting the balloon. Also, do not actuate the cable by opening and closing the damper while the Chimney Balloon is in place. Remove the Chimney Balloon before you move the cable. Also, purchase a Chimney Balloon that is a little oversized to allow for the extra material to envelop the cable. Two or three inches extra in length and width should give you what you need. In this photo example, a 33×12 could have been used normally, but they bought a 36×15 to get it around the damper cable.